Summer Roundup takes place at Camp Todd Girl Scout Camp just outside of Denton, off of Route 16. Cost is $200 per girl and includes all meals, snacks, camp t-shirt, program supplies, craft projects, and length of stay. Camp begins on Sunday, July 28, 2019. Check-in is from 2-3pm. Girls must be checked in by the director and the camp nurse before proceeding to their camp units. Please park in the lot and bring your daughter only (no gear) to be checked in. After she is checked in, you may retrieve her gear and help her take it to her bunk. Driving to units is strictly forbidden to ensure the safety of everyone at camp. Camper Packages will be offered at registration, but this year, they will be made to order. You will have your choice of items, ranging from t-shirts to water bottles and flashlights to sweats plus lots of things in between. This package must be ordered no later than March 15, 2019. All proceeds from the camper packages go to our Summer Roundup Camp Scholarship Fund. PLEASE NOTE: We are not able to provide stamps for every child at camp. If your child wishes to write home, please be sure to provide her with stationary, stamps, and address labels (or pre-addressed envelopes). Pre-stamped postcards will be available for purchase at check-in. Please provide pre-addressed labels for the postcards. All girls are given the opportunity to choose from an assortment of activities each day and are not bound to one or the other. 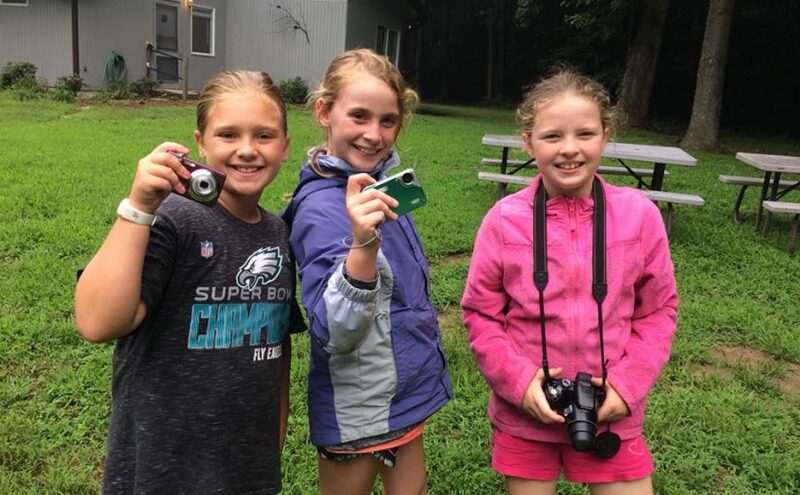 These activities include swimming, boating, archery, and zip lining, a rock climbing wall, Art in the Woods, Music in the Woods, the Ninja obstacle course, yoga, and zumba. Teen Program Aides are assigned to all units with 1st through 6th graders. The teens may help with fixing hair and getting dressed in the morning, staff the shower house, and assist with programs. All programs are run by an adult and have at least one additional adult assistant and one teen program aide. All programs are limited to 10-12 girls. Programs must have at least 6 girls in order to run. Girls in programs that have fewer than 6 girls will be combined into one program based on their 1st and 2nd program choices. Evening activities include a unit night with campfire, evening games with all of the campers and staff, a dance with our favorite DJ, DJ Star, and a closing night bonfire and flag retirement (donated flags that are in need of retirement are always welcome). Camp ends at 11:00am on Friday, August 2 with our closing ceremony and awarding of patches. Please join us for the ceremony. You may arrive between 10:30 and 11:00am and pack your car before the ceremony if you wish. Girls will remain in morning activities until 10:55 and will then line up and prepare for the ceremony. Please do not go to the camping units to collect your daughter or her bags. Everything will be brought to the program center, and all girls must be checked out by their Unit Leader. PLEASE DO NOT ARRIVE BEFORE 10:30! We know that you will have missed your daughter/s, but we are still in programming and activities until 10:55 and are still getting things ready to close camp. Early arrival of parents may prolong the ceremony for everyone and could pose a safety hazard for the girls. Please park in the lot and walk to the program center to check out your daughter. We have a formal check-out procedure and must see each parent. Please be prepared to stay for the ceremony. All equipment MUST be labeled with the camper’s name. PACKING HINT: Pack each day’s clothing including socks and underwear in ziplock bag labeled with the day to be worn. •Extra pair of old shoes – a real lifesaver sometimes -remember it’s no fun to walk around in wet shoes or with blisters. •Bandanas to wear for drying hands, cooling face, tying hair, etc. **Change of clothing to last the girl’s stay including long pants and long Sleeved shirt/sweatshirt – YES, we DO sometimes put on sweatshirts early in the morning, even in August! If you choose to boat on any day, you may want to bring an old pair of shoes or water shoes to wear in the water. Girls who choose to swim, may want to bring shoes to wear in the water. ** To protect girls from insect bites and sun, tube tops, tank tops, and spaghetti straps are not permitted. Stamps and mailing labels – postcards are available for sale on the first day of camp and include stamps. If your daughter is bringing her own postcards or stationery, you must provide stamps. Mailing labels are also quite helpful since the girls don’t always know the addresses for the mail being sent. Please don’t rely on our volunteers to look up every address. Because of many exposed tree roots and branches and to prevent blisters, girls must wear socks and closed toed shoes at all times (only exceptions are shower time and on the beach when closed toed crocs may be worn). Label ALL articles with camper’s name (from bathing suit to underwear and everything between). Pack everything in waterproof bag or pack (or pack items in ziplock bags). Campers are not permitted to bring any food, gum, or candy as it attracts critters. Please be careful about scented soaps, flavored toothpaste, etc. as they can also attract critters. NO RADIOS, TAPE PLAYERS, IPODS, CELL PHONES, DS GAME SYSTEMS, ETC ARE PERMITTED. iPads and Kindle/Nook eReaders will be permitted at night, but we cannot guarantee their safety. It does rain at camp! If there is a problem with one of these devices at camp, it will be taken away and given to parents at the end of camp. PLEASE remember we will be at camp – girls and clothing WILL get dirty and may get wet, so pack accordingly. Send all mail before the Tuesday of camp to ensure that it arrives on time. Mail may be sent the week before camp begins (you may label the mail according to the day it is to be given). Mail may also be brought to camp on the first day and dispersed throughout the week. Please be sure to only relay happy news. Do NOT write that the dog died, or that you miss her, or that the rest of the family is enjoying a great spontaneous vacation without her! Also, please do not send photos that will cause her to become homesick. Girls may send mail home as well. They must bring their own stationery and stamps. If your daughter bought the camping package or Summer Roundup postcards, stamps are included. Postcards will be available for sale at camp check-in.